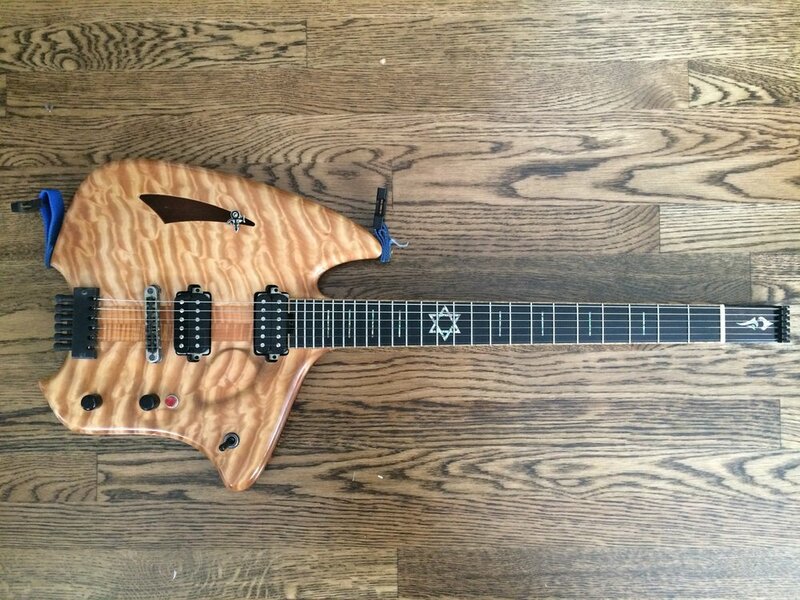 I often get asked about this strange guitar, well not strange to me, but definitely strange to the first time viewer:) It was built by good friend and amazing luthier, Christopher Forshage of Forshage Guitars about 10yrs ago. His concept, if I recall correctly, was to make a guitar that was very comfortable and ergonomic, so that the weight and balance was accurate, as to lessen the amount of pressure on the shoulder. Also designed to be very easy to change the guitar strings, not having to endlessly wind up the tuning knobs, and not having to have a tool to cut the strings. On top of all of this, it sounds and plays impeccably! The action on this guitar is the best I have ever played. It is so very easy on the fingertips. It stays in tune very well and the intonation usually stays in tune for a long period of time. I would guesstimate that I usually like to take it to Chris once a year to have the intonation adjusted. For those unfamiliar with intonation, it is having the notes at the top of the neck in tune, while the notes at the bottom of the neck are also in tone. So, if you played a note on the first fret of the high E string (bottom string), it will be completely in tune as an E, not flat, not sharp. And then when you play a note on the 24th fret of the same high E string (highest note on the guitar), it will also be an E, not flat, not sharp. Overall, I am blown away by this guitar. I had played a few guitars leading up to this one, and had developed very bad upper back, neck & shoulder problems from poorly weighted / heavy guitars. The Ergo, along with a list of amazing Massage Therapists and Yoga:) has been a big help.